When it comes to presentation time, people have some strange ways of psyching themselves up in order to feel prepared. From silent meditations to imagining the audience in their underwear, everyone seems to have last minute tricks that are supposed to make the experience easier. After all, seeing as some people’s fear of public speaking is even greater than their fear of death, these rituals are understandable. It’s no surprise that the most polished presentations come from a commitment to practice. However, presenting information you may have experience with may make you feel as though planning ahead is unnecessary; this way of thinking can get you into trouble, as explaining your experiences for others to understand can be tricky! Beginning from an outline, developing those ideas into a script and continually reviewing and revising this content is a great way to become comfortable with the material. When it comes time to practice delivery, it’s most important to do so in an environment similar to the one you’ll be facing during the real thing. If at all possible, try to gain access to the room, stage or other presentation area before your scheduled time in order to get a feel for the space. Pay special attention to the room layout and any on-going noises that may affect the audience’s ability to see and hear. Also, this is a great opportunity to check the technology in the room to ensure it’s ready to run. 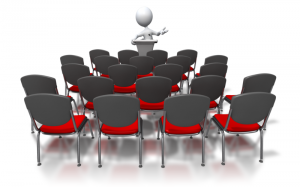 Many presentations have an electronic element that is used to enhance the message being delivered; this can come in many forms, from a PowerPoint presentation, to an embedded video or even an interactive audience Q & A response tool. Regardless of the technology being used, it’s extremely important to test and retest all elements of a presentation prior to the real deal. If you’ve been practicing your presentation using a personal computer, ensure that your files work on the computer or other tool being used in the presentation room. Always have back up files in place for needed documents, either on a flash drive or in an e-mail inbox. If your presentation requires you to click and follow links, double check that these links direct to the right place. The last thing you want is for a minor technical concern to derail you as you speak! When it comes to public speaking, it’s best to follow the rule of, “the more, the merrier!”; after all, it is called public speaking! If you’ve been rehearsing solo the entire time, it could be a bit of a shock when you stand up in front of a full room of people. Help yourself to become comfortable with the crowd by rehearsing the presentation in front of family, friends or coworkers. Practicing like you would perform ensures that your content will be clearly understood by a diverse audience and can help to clean up any presentation bad habits you may fall victim to. Public speaking can be a scary experience, but most of the fear comes from a place of uncertainty. By preparing your content thoughtfully and practicing your delivery under real life conditions, you can help set yourself up for success. How do you build you confidence for a presentation? Let us know by sharing your stories below! This entry was posted in Currently Employed and tagged confidence, group presentations, meetings, practice, presentations, public speaking, technology. Bookmark the permalink.